This sage green sapphire ring is both unconventional and very sparkly. 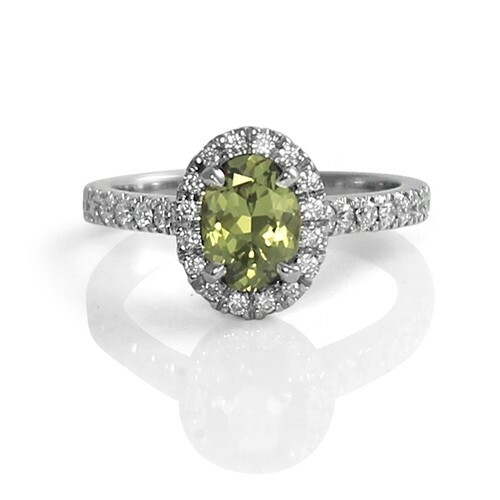 The 1.05 oval green sapphire is beautifully cut and shows its colour to full advantage. The colour is very romantic and is highlighted by the diamond halo. It works beautifully as either an interesting and unique engagement ring or as a right-hand heirloom ring. It's a very special stone. This ring is one of our "Studio1098 Staff Picks" because it's really a stunning piece in an unusual and wonderful shade of green. Beyond being eye candy, the oval shape really elongates the wearer’s fingers adding a touch of glamour.